3:01:00 PM Now level 63, with health averaging around 6600. 7:46:00 PM I find these to be one of the sneakiest stalkers in swg...Ive had many of these sneak up on me and aggro before I would notice them..hehe. 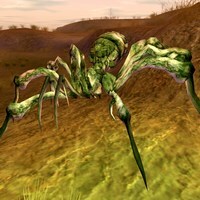 They are actually decent pets and can be found in many places on Endor with varied earthen mound spider nests combos. 4:42:00 PM This creature gives me 491 exp points of DNA exp. I sample these on Endor. I have seen Babies. Good to sample when going from DNA 3 to DNA 4. They spawn quite a bit and if you aggro them they don't kill you. 6:32:00 AM Added Social = yes. This creature most certainly is Social, at least in all encounters I've had with it which are many.